The songs were composed at the end of the summer of 1943. Someone brought the composer the first edition of Les yeux d’Elsa (published wisely in Switzerland) by Louis Aragon (with his wife Elsa cast in a Nusch-like role of inspiratrice). 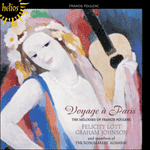 Poulenc would have skipped the pontifications of the thirty-one page preface and noted a sequence of night-poems, including La nuit de Dunkerque where the uncompromising and self-regarding guardian of Communist party purity turns chansonnier in time of war. Fêtes galantes follows on page 49 and C on page 55. The composer had known Aragon (1897–1982), uncomfortable surrealist colleague of Éluard, since his teens, but his poetry is not Poulenc’s normal stamping ground. As in Miroirs brûlants he conceived a twin-set where a deeply serious song is followed by a helter-skelter scherzo. Les Deux Poèmes de Louis Aragon sont du parfait Poulenc. Dans C, Louis Aragon (1897–1982) voit dans la chute de la France entre les mains allemandes, en 1940, le piteux dénouement de siècles de fausses valeurs et d’un patriotisme fondé sur l’exploitation des classes. Sur le papier, les mots peuvent paraître amers et rageurs, mais Poulenc y décèle le déchirement: le poète marxiste et le compositeur châtelain (il possédait une superbe maison de campagne à Noizay, près de Tours) sont unis dans cette chanson par un même droit d’être français. Fêtes galantes est un antidote à un apitoyement par trop nationaliste. La nation qui produisit les courtisans froidement élégants des «Fêtes galantes» de Watteau, sous le règne de Louis XV, est maintenant en plein désarroi, sous l’assaut des envahisseurs nazis. L’élégance n’est plus guère de mise dans la comédie de mœurs, mais les mœurs ont beau partir en fumée, la comédie reste. La vie sous l’Occupation changea bien des choses, mais l’institution de la chanson de cabaret, chantée à plein gosier, vulgaire et poétique à la fois, ne pouvait être qu’insolemment, irrésistiblement française. Les Ponts-de-Cé is a commune near Angers, the site of a battle in the Hundred Years War. With some historical license with regard to the town and its bridges, C is Aragon’s Marxist take on the history of France whereby there is a trajectory to be traced between the abusive sixteenth-century aristocracy in their Loire chateaux and the country’s inevitable fall to the Nazis (it is also something of a virtuoso exercise in end rhymes). The poet’s lyrics were admired by a number of left-wing popular singers (Léo Ferré comes to mind in a later generation) but Poulenc is not at all interested in agitprop, only the sadness and pathos of France’s demise. Aragon’s lament has an angry agenda (German occupation is the crowning disaster of many ‘false glories’ in French history) which Poulenc simply ignores. He composes the song in his own small chateau near the Loire, and he has no right to castigate the upper classes (to which he more or less belongs) for their decadent errors; instead he embraces France tenderly (infiniment doux is the marking at bar 21) as if it were a wounded lover who will one day recover. His music adopts a shadow of popular culture, a hint of nightclub and boulevard (the song is dedicated to Marcel Royer—‘Papoum’—who first introduced his composer-nephew, when still a boy, to this musical world) without trivializing the mood of a dignified patriotic song about the life and death of a nation. Not even two floated high A flats, openly sensual, can undermine the song’s seriousness of purpose, unless uninformed singers are determined to smooch and swoon their way through music that is gorgeous, certainly, but chiefly heart-breaking. The four-bar introduction, a long arc of rising and falling quavers, is a miracle of harmonic eloquence, although unharmonized, and the unusual key of A flat minor occasions some of the composer’s most exquisite excursions and sequences. This is a masterpiece known the world over; it is the most unusual, and perhaps the most moving, song about the ravages of war ever composed. 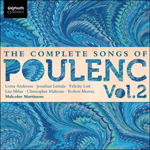 The Deux Poèmes de Louis Aragon are perfect Poulenc. In C, Louis Aragon (1897–1982) sees the fall of France into German hands in 1940 as the sorry outcome of centuries of false values and a patriotism that had been based on class exploitation. 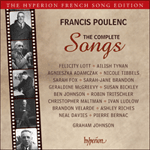 On paper the words can seem bitter and angry, but Poulenc finds the heartbreak in them: Marxist poet and château-dwelling composer (Poulenc owned a beautiful country house at Noizay near Tours) are united in song by a common French birthright. Fêtes galantes is an antidote to too much nationalistic self-pity. The nation that produced the coolly elegant courtiers of Watteau’s ‘Fêtes galantes’ in the reign of Louis XV, now finds itself in complete disarray with the onslaught of the Nazi invaders. There is not much elegance left in the French comedy of manners, but even if manners are thrown out of the window, comedy remains. Life under the occupation changed many things, but the institution of the cabaret song, sung at full tilt, vulgar and poetic at the same time, could never be anything but defiantly, irrepressibly French. I have crossed the bridges of Cé. And life whirling by in a slap-dash way. In June 1940 the entire Parisian population seems to have been convinced (inaccurately as it turned out) that the arrival of the ‘Bosch’ would lead to bombardment and large-scale destruction and terror. This resulted in an exodus en masse of Parisians which Aragon describes with the relish of Schadenfreude. His poem has funny lines but it is without humour; there is a grim calling to account here: descendants of ‘aristos’ whose japes on the lawns of Versailles had been depicted in the Fêtes galantes of Watteau and Verlaine are now forced into a game where their power and privilege count for nothing and where they must compete for survival, hugger-mugger, with the working classes. It is perhaps equally insensitive of Poulenc to have made light of an event which caused so much anguish, but his decision to cast this song in the implacable rhythm of a chanson-scie (a music-hall genre featuring obsessive repetition—in this case the ‘On voit’ beginning of each line) softens Aragon’s contempt and finds an excuse for hoopla of the ‘we are all in this together’ variety. For Aragon the phrase ‘true values in jeopardy’ presages the coming of Bolshevik revolution, whereas for Poulenc it is a blip in the ‘comédie humaine’. Nevertheless, an intelligent performance makes of this something more ominous than a good-natured romp, and the pressure put on singer and pianist to master all the words and notes at breakneck speed generates a certain appropriate tension. The listener is redirected to Tempête en juin from Irène Némirovsky’s Suite française for a thrilling and moving evocation of the flight from Paris in those bizarre days of temporary madness.